The recently-announced R-rated reboot not only killed any chances of Guillermo del Toro and Ron Perlman completing their would-be Hellboy trilogy, it also eliminated a BPRD (Bureau for Paranormal Research and Defense) spin-off film that had been in the works, off and on, for seven years. Earlier this month, it was announced that Millenium is going to reboot and relaunch Hellboy. At the moment, its title is Hellboy: Rise of the Blood Queen and will star Stranger Things' David Harbour as the kitten-loving, cigar-smoking antihero. Neil Marshall, who is best known for directing the "Blackwater" and "The Watchers on the Wall" episodes of HBO's Game of Thrones, is at the helm. He'll be working from a script penned by Andrew Cosby, Christopher Golden and Hellboy creator Mike Mignola. However, there was also a Hellboy spin-off film that met a swift demise, too. A day after the reboot was announced, Peter Briggs -- who co-wrote the story for 2004's Hellboy -- revealed that he has been working on a BPRD spinoff film for Universal since 2010. The spin-off would've starred Abe Sapien, the nearly 150-year-old aquatic and kind empath who uses his psychogenic power to read an object and know its past or future. Doug Jones put on Abe's costume once again; however, Briggs didn't mention whether or not David Hyde Pierce would return to voice the role. He did say that Jones would also repries the role of the Angel of Death. Aside from that, it would've also featured the return of John Myers, the young FBI agent that only appeared in the first film and became Hellboy's rival for Liz's affection. But, most importantly, the villainous Prince Nuada was going to appear in it -- although he died at the end of Hellboy II: The Golden Army. 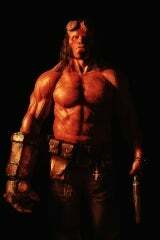 Internally, Universal were keen to make a "Hellboy" spinoff based around the character of Prince Nuada from "Hellboy 2" (about which I had nothing to do with, although amusingly my then-girlfriend Tracey Wilson was the storyboard artist on the film), and asked if I was interested in writing it. I said I was, although there was the slight problem of Prince Nuada being...ah...um...slightly "dead" at the end of "Hellboy 2". I also pushed a little bit that, if it came off, I'd really like to direct it and make it in New Zealand. Universal were agreeable and said we could discuss that at the appropriate time. I was working with Richard Taylor at Weta in New Zealand back then, and discussed the possibility of doing this with Weta with Richard. I started working on an outline with my Los Angeles-based "Panzer 88" co-writer Aaron Mason while still in New Zealand. It was called "Hellboy: Silverlance", and we solved the "Nuada Problem". Although we never really discussed it as such it really was a "B.P.R.D." movie. The aquatic Abe Sapien was the main character, and Hellboy still featured fairly prominently in it. I suppose you could liken it to a "Suicide Squad" situation: Batman was in there, but the story wasn't really about him. Aaron and myself turned it in. Universal really wanted to proceed with it, but after further discussions at the studio it was apparent a "Hellboy 3" was still on the cards for the studio and more of a priority, so "Silverlance" got back-burnered. I figured that was the end of that. The one caveat Universal gave us was that the character of Hellboy himself now couldn't be shown. We reworked and expanded the project out. The story had a sort of "Highlander" structure to it. Moving into their new Bureau For Paranormal Research And Defense headquarters in Colorado, Abe is troubled still by his psychic connection with Princess Nuala from "Hellboy 2", so researches the history of Nuala and Nuada. We would have seen Nuada's connection to a rival fairy courtier who seeks control of the fairy kingdom (and Nuala's hand in marriage), and engineers the machinations that cause Prince Nuada's expulsion. We'd have seen Nuada in different timezones down the centuries, including his first meeting with Mister Wink in Spain during the Spanish Inquisition (Nuada saves Wink from a troupe of soldiers); and Nuada in Nazi Germany in World War 2 engineering a pact to keep various supernatural entities unharmed from the conflict. (We would have seen Nuada and Kroenen fighting in a "friendly" bout for a bunch of Project Ragnarok goons.) Doug Jones would have been playing twin characters of both Abe and a reprise of the Angel Of Death, with whom Prince Nuada strikes a bargain. Agent Myers from the first "Hellboy" film would have returned. The story reached a rousing action climax at the B.P.R.D. Colorado headquarters and used Rasputin's summoning gauntlet from the first movie (and we did manage to sneak Hellboy in for a cameo in one scene!) If it had been successful, it would have been the first in a series of "From The Files Of The B.P.R.D." projects. Things were quiet throughout 2016, but just before Christmas 2016 I was in Bath in England when we got the call from Universal to say that it looked like "Silverlance" was once more back on, but it was looking a little unclear. (This really surprised me, as I'd assumed after the early 2016 conversation the project was scuppered for good.) I kept in touch with Universal periodically into 2017. With the announcement of the Neil Marshall "Hellboy" reboot project yesterday, I think it's safe to say "Silverlance" is now officially dead. As a fan of "Hellboy" for 25 years, I'm curious to see how the new Millennium project turns out. Mike Mignola created Hellboy in 1993. Hellboy is a demon summoned to Earth by Nazi scientists, but who was recovered as a child by the Allies and raised by the head of the Bureau for Paranormal Research and Defense, or BPRD. Hellboy grew up to become a member of the BPRD himself, investigating supernatural occurrences and fighting monsters. Hellboy's blend of vintage pulp action and mystery, folklore, and Lovecraftian horror and fantasy has turned it into one of Dark Horse Comics’ best-known publications, spawning several spin-offs such as a BPRD series, Lobster Johnson, and a prequel series titled Hellboy and the BPRD. Mignola recently killed Hellboy himself but continued to tell his story in the after in the pages of the 10-issue Hellboy in Hell series. The expanded "Mignola-verse" offers plenty of material for an expanded film and television universe. Hellboy has also appeared in two animated features, Sword of Storms and Blood and Iron, as well as two video games, Asylum Seeker and The Science of Evil. How Does Avengers: Endgame Set Up Phase 4 of the MCU? Is There Time Travel in Avengers: Endgame? Who Dies in Avengers: Endgame? Which Marvel Characters Return in Avengers: Endgame?